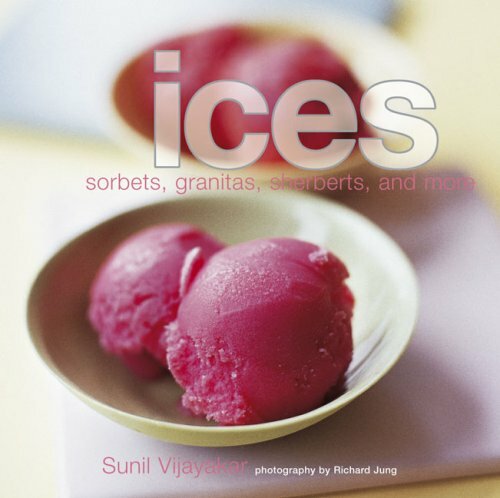 This beautiful book offers more than 35 easy and delicious recipes for frozen treats. There are fresh fruit pops, ice cream cones, contemporary sorbets, frozen yogurts and soufflés, mouth-tingling granitas, sherbets, and wonderfully flavored frappes, slushes, and frozen drinks that will appeal to adults and children alike.The fabulous feast begins with Iced Pops and Confections, including Mint Julep Sticks, Iced Strawberry Hearts, and layered Mixed Berry and Citrus Cones. At the heart of the book are Sorbets and Frozen Yogurts and Soufflés. In the first category are Chile Lime Sorbet, Champagne Sorbet, and Nectarine and Almond Sorbet, while the yogurts and soufflés include Maple-peach Frozen Yogurt Squares, Marbled Strawberry and Blackberry Yogurt Cups, Iced Mixed Berry Frozen Soufflé, and Spiced Citrus Frozen Soufflé. From Granitas, Sherbets, and Ices, choose zingy Mandarin and Star Anise Granita, Spicy Plum Sherbet, or Blood Orange Ice. A chapter on Frappés, Slushes, and Frozen Drinks completes the array of refreshing delights, with ideas ranging from Rhubarb and Ginger Frappé to Frozen Apple and Cinnamon Spritzer and Iced Piña Colada.